Painting on the left: Smith (NYC), down on the right: Sharp (NYC). It happened during Spring 1993 at our hall of fame in Giambellino. After having met Sharp and Smith at WAG shop, I offered them to come with me the day next for some action. I remember collecting cans for these very special guests from all the friends and painting white (actually light light blue!) the whole wall during the same afternoon (at that time there was still no type of aerosol-art spray paint labels, we were just mixing Dupli Colors with other local spray cans). 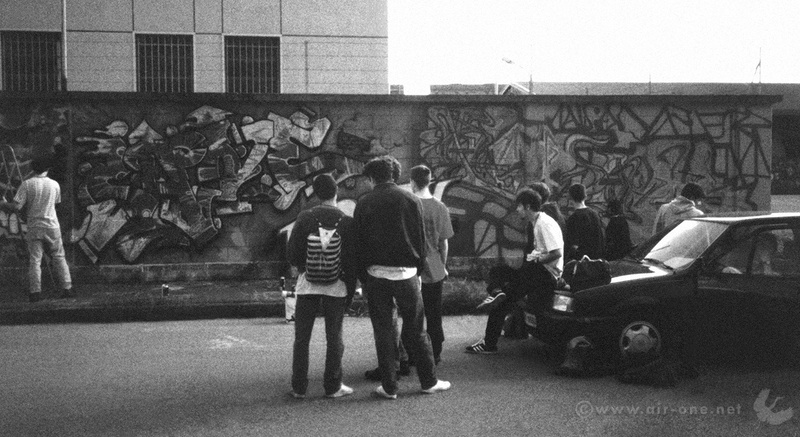 The next day the sun was shining and we were all chilling at the hall of fame: I’m the one on the right sitting on my old VW Polo, I cant recognize the rest of the people ’cause they are looking toward the wall, but I can remember the whole Giambellino crew went there during that day, THP + MNP + probably someone from 16K and ZN13. After that I stayed in touch for years with Smith and later in 1997 we met again in NY. Sharp is often around Europe so we met many more times… he’s a great artist and an old friend. They both have been a great inspiration for me. Hey, you can look at them painting in fullcolor here and here too!